Prepare lasagna according to package directions. Drain and rinse in cold water; drain well. In a large skillet, heat olive oil over medium-high heat and sautÃ© garlic, onion, carrots, celery and mushrooms until tender, about 5 minutes; remove from heat. Using the same skillet on medium heat, brown hamburger and Italian sausage, season with salt and pepper, stirring and crumbling meats. Cook about 10 minutes or until no longer pink. Drain juices. Mix in vegetable mixture. Spray 13x9x3 baking dish with non-stick cooking spray. Spread 1 cup of marinara sauce on bottom of baking dish. Layer 3 lasagna noodles, 1/3 of ricotta cheese, 1/2 of the meat mixture, 1 cup marinara sauce, 1 cup mozzarella cheese. Layer 3 lasagna noodles, 1/3 of ricotta cheese, 1 1/2 cups marinara sauce. 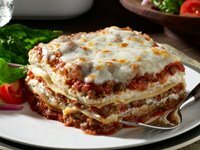 Layer remaining lasagna noodles, ricotta cheese, meat mixture, marinara sauce, mozzarella cheese and Parmesan cheese. Cover pan with tin foil and bake for 45 minutes. Remove tin foil and bake another 10 minutes. Let stand for 10 minutes before cutting. Recipe Yield: Yield: 12 servings. Chicken Nuggets: Good Intentions Gone Bad?